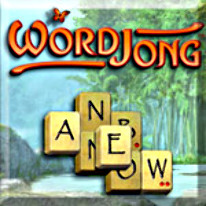 Enter the lush world of WordJong, a colorful mix of Mahjong and a spelling game! Remove letter tiles from the board Mahjong-style to spell big words for bonus points. Each set of tiles is a new game to play, with dozens of layouts to enjoy. The three unique ways to play - Classic, Versus and Link mode - will keep you spelling for hours. Build words to clear the board in Classic Mode. In Link Mode, the last letter of your word becomes the first of the next word. Play against opponents in Versus Mode. Challenge a friend or a clever cast of in-game WordJong Masters.